Edward Norton Hulk drama: Better days, with Norton as Bruce Banner in The Incredible Hulk. July 12 update: First Marvel's Kevin Feige lambasted Edward Norton, who played Bruce Banner in Louis Leterrier's 2008 The Incredible Hulk, in a missive sent to hitfix.com. Feige bluntly explained that Norton's temper had been the cause for the actor's being dropped from the upcoming The Avengers. Then Norton's agent lambasted Feige for having sent out such an undiplomatic – and, according to the agent, also untrue – notification about his client. “As most of you know, I don't like to talk much about the business of making movies because it means a lot to me to protect the audience's fullest enjoyment of the 'magic' that films can have. But I am so appreciative of the outpouring of support from fans of the Hulk and the Avengers that I feel it would be rude not to respond. “So here goes: It seems it won't work out for me to continue playing Bruce Banner for Marvel in 'The Avengers.' I sincerely hoped it could happen and be great for everyone, but it hasn't turned out as we all hoped. I know this is disappointing to many people and that makes me sad. “But I am very sincerely grateful to Marvel for extending the offer and even more so for giving me the chance to be a part of the Hulk's long and excellent history. And I really can't thank the fans enough for how much enthusiasm you've sent my way about what Louis and I tried to do in our turn with the legend. It means a lot to me. I grew up with Banner and Hulk and have been a fan of every incarnation. Edward Norton, the star of the 2008 hit The Incredible Hulk and an Academy Award nominee for Primal Fear and American History X, will not be returning as Bruce Banner and his green & brawny alter ego in the upcoming Marvel Studios film adaptation of The Avengers. Salary negotiations were reportedly under way when hitfix.com broke the news yesterday that Norton, who will turn 41 in August, wouldn't be welcome at the superhero gathering due out in summer 2012. To be directed by Joss Whedon, The Avengers should star (some of those names have only been rumored) Robert Downey Jr (Iron Man), Chris Evans (Captain America), Scarlett Johansson (the Black Widow), Chris Hemsworth (Thor), Samuel L. Jackson (Nick Fury), Jeremy Renner (Hawkeye), Don Cheadle (War Machine), and Clark Gregg (Agent Phil Coulson). 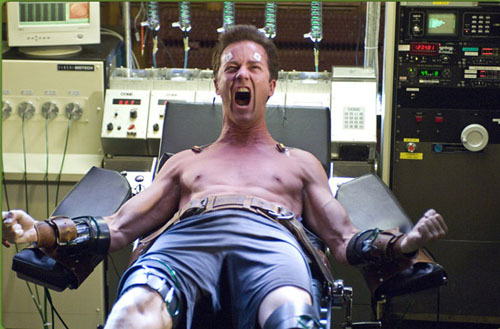 Edward Norton The Incredible Hulk photo: Universal Pictures. Mark Ruffalo to play Bruce Banner a.k.a. The Incredible Hulk? According to Deadline.com, Ruffalo is in late-stage talks to take on the role of Banner in Marvel's film project The Avengers. The Hollywood Reporter, however, says otherwise. Although Ruffalo has been offered the role, he has not decided on whether he wants it. He should be meeting with The Avengers director Joss Whedon in the coming days. Edward Norton, who played the angry green hero in Louis Leterrier's The Incredible Hulk in 2008, was considered for the part before Marvel unceremoniously dropped him. Other names – e.g., Joaquin Phoenix, David Tennant – have since been mentioned as “possibilities.” Ruffalo is the latest one. This year, Ruffalo has earned raves for his performance as the biological father of Mia Wasikowska and Josh Hutcherson in Lisa Cholodenko's indie hit The Kids Are All Right. Of course it's not about money, when Hollywood won't be able to pay the actors for its movies? What a bullcrap! Norton is the right actor for the movie, I just finished to watch the Avengers and no offense but that new actor who plays Hulk is just not good enough! Mr Norton was Hulk and so he should continue to be Hulk as the other actors continue to play the roles of their heroes! The directors who've disagree to take Mr Norton should feel ashame! That's an insult, We, the fans don't care about what problems they had with Mr Norton to make this decision, what we care about is seeing the right actors playing the right heroes and Mr Norton is Hulk! Not that guy coming out of nowhere!